Shrub is a drinking vinegar. Containing the same fermented food benefits as pure vinegar, the fruit in shrub is fermented for a shorter period of time than pure vinegar & usually has a few fruits blended together. Mixed with sparkling water or spirits, Shrub makes a refreshing natural drink to quench your thirst. Just like pure vinegar, shrub is a pro biotic-rich living food, full of antioxidants and nutrients. 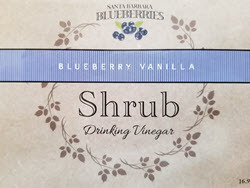 The berries in our Blueberry Vanilla Shrub are naturally raised at Santa Barbara Blueberries.